With a gold medal for Furzey Gardens and Sparsholt College, the 67th consecutive gold medal for Hiller Nurseries, the 17th gold medal for Hardy’s Cottage Garden Plants, the 14th gold medal for Hampshire Carnivorous Plants, and a gold medal for Ainsworth Displays, Hampshire exhibitors did a fantastic job at the 99th Chelsea flower show. Chris Beardshaw was delighted to win gold for Furzey Gardens – an exhibit he designed to celebrate their 90th anniversary. Using one of the largest plots at Chelsea, Chris replicated a sloping woodland, incorporating a large collection of acid-loving plants and shrubs, including rhododendrons, azaleas, acers and primulas amid reclaimed timber and thatch. 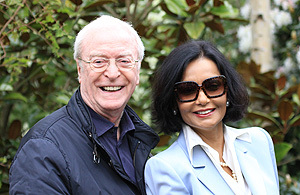 “We’re showcasing some exciting plant introductions which relate to the great plant hunters George Forrest and Frank Kingdom Ward, alongside many ericaceous plants and shrubs which are not generally seen at Chelsea,” said Chris. To create the garden, Chris worked with students at the Minstead Training Project, the sister charity to Furzey Gardens Charitable Trust which provides services for adults with learning difficulties. Students influenced the design, grew plants and assisted with the build. It is the first time students with learning difficulties have been represented and involved directly with a Show Garden at the RHS Chelsea Flower Show. The garden features The Lantern – a bespoke reclaimed timber and thatch structure created for RHS Chelsea by Master Thatcher, Simon Sinkinson who has worked with Furzey Gardens for the past 30 years. Designed as a meeting place, the structure includes a tiny fairy door, the likes of which are enchanting favourites with children at Furzey Gardens. Furzey Gardens will be left with the legacy of the Lantern and other elements of the show garden for years to come. Sparsholt College were also delighted to win gold and they had the additional accolade of being voted Best Exhibit in the new RHS Environment category. Their garden ‘The Space Race’: maximum cropping from the minimum space, focused on the theme of urban greening, providing inspiration on how it is possible to grow a wider range of produce or ornamental plants in small spaces to provide multiple functions such as increasing biodiversity and encouraging sustainable communities. The combination of both beauty and functionality was the key to their medal success. The exhibit had the feel of an urban allotment. Herbs such as thyme, rosemary and lavender as well as super foods and fruit highlight the importance of home grown produce and the need to move forwards towards global food security. A herb planted patio created a sensual aroma for visitors to experience whilst in the seating area. Touch screens allowed visitors to interact with the exhibit, and provide informative advice on new growing techniques such as Square Foot Gardening and plant, fruit and vegetable cultivars –varieties produced by selective breeding. As ever, the huge Hillier Nurseries stand in the centre of the Floral Marquee looked amazing. The theme for 2012 was the ‘Dual and the Crown’. 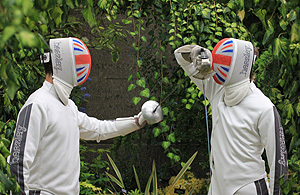 The fencing-themed exhibit had its origins in the history of the Chelsea showground itself. Until the outbreak of the Second World War, fencing competitions were regularly held at Ranelagh Gardens in the grounds of Royal Chelsea Hospital. There were live demonstrations of fencing by members of the British Fencing team, marking the return of fencing to Chelsea after a 70 year absence. 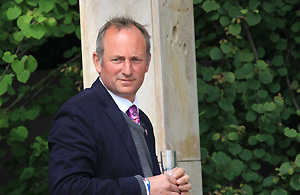 Andy McIndoe, MD of Hillier Nurseries designed the dramatic exhibit as a tribute to Her Majesty The Queen in her Diamond Jubilee year. A pathway led through the exhibit, past ponds bordered by gunnera manicata, beneath golden arches of hedera clochica ‘Sulphur Heart’ and past stunning displays of sword-like foliage from plants such as phormiums and cordylines. The display was all set against a backdrop of specimen trees and interspersed with fencing themed art. Maintaining her status as the most successful ever female exhibitor at Chelsea, Rosemary Hardy was awarded her 17th gold medal. Their stand this year took on a slightly more organic, free flow form than recent years, complete with pathway and water feature and the planting was in more open beds, creating a different feel. A pretty lilac swing seat provided a place to stop and admire the gorgeous collection of herbaceous perennials. Hampshire Carnivorous Plants won gold for their display which included a wide range of Sarracenia species and hybrids suitable for the garden or unheated greenhouse. Some of their highly unusual carnivorous plants have and will only be shown at RHS Chelsea. Palm tree specialists Ainsworth Displays from Waterlooville won a gold medal for their display of palm trees in the Great Pavilion. Exhibits included Chamaeropsis Humilis, Chamaeropsis Humilis Bulcamo, Chamaeropsis Humilis Argentea and Chamaeropsis Humilis Spella. Only 15 years ago there was only known to be one member of this family and Ainsworth Displays were proud to now be able to show four. New Hampshire company Hortus Loci helped Cleve West win his Best in Show for the Brewin Dolphin Garden by supplying top quality plants. They also supplied gold medal winners Joe Swift (Homebase Teenage Cancer Trust Garden), Andy Sturgeon (The M&G Garden) and silver-gilt winner Thomas Hoblyn (The Arthritis Research UK Garden). Also in the Floral Marquee was the Heucheraholics exhibit – a beautiful collection of heucheras in gorgeous shades of purple. Four new heucheras were lanched. Every year there are over 70 new plant introductions at Chelsea but only the top 20 are shortlisted. Hampshire exhibitors did very well to get four plants on this list: Choisya ‘Aztec Gold’ (Hillier Nurseries), Nepenthes ‘Linda’ (Hampshire Carnivorous Plants), Osteospermum ‘In the Pink’ and Leucanthemum superbum ‘Freak!’ (Hardy’s Cottage Garden Plants). Osteospermum ‘in The Pink’ (from Fairweather’s Nursery) is notable as it can survive temperatures as low as minus ten degrees Celsius. 20 pence from every plant sold will be donated to Breast Cancer Care. 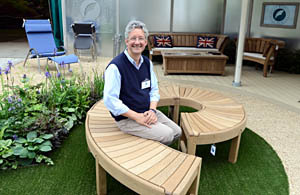 Alton-based Gaze Burvill made the shortlist for Product of the Year with their Jubilee Spiral seat. In keeping with their handcrafted steam-bent oak furniture, the spiral was very elegant and a beautiful piece of garden furniture. The stand also featured new pieces such as the Lizard Lounger and a mini spiral bench, and older favourites, like the Splash Sofa in oak, a charming round Bailey Table and May Thrones. The planting on the display was created by garden designer Alex Foster who is based in Winchester. It included fish sculptures in a bed of waving grasses which set them off very well. Geoffrey Wheating, director at Gaze Burvill was very pleased with the way the exhibit turned out and especially liked Alex’s natural planting. Country Greenhouses from Petersfield launched a new greenhouse at the show – The Acer. The design is a true replication of traditional wooden Victorian greenhouses inside and out, in aluminium. 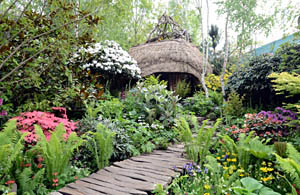 Their garden was designed by Sparsholt College student Helen Parsons who won a competition amongst her fellow students. She wanted it to be deliberately ambiguous as to whether the greenhouse was in a rural, urban or suburban garden. Alitex Limited of Petersfield showcased two of their greenhouses. The first structure was a mono-pitch lean-to greenhouse with a full complement of accessories from Shades, Cold Frames, Vent Slides, Benching, Reservoir and Lighting. 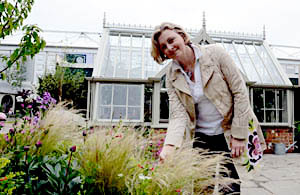 The second structure was a Scotney Greenhouse from the National Trust Collection. 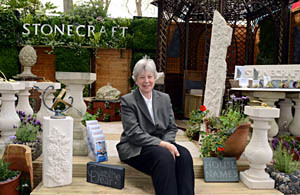 Caroline Dear, stonemason at Southampton-based Stonecraft was showcasing her talents with a stand of beautiful sculptures. Working with natural stone she crafts pieces of great beauty. Her latest Jubilee sculpture was on show along with smaller pieces that would add interest to any garden. Nether Wallop Trading designs also had a trade stand. Their stand featured a full range of products for gardeners plus foraging and harvesting tools, including the herb dryer, which was shortlisted for the RHS 2011 Chelsea Product of the Year. 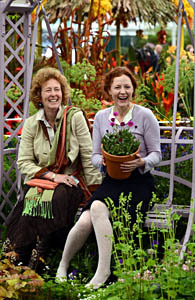 Chelsea 2012 was a great show for Hampshire exhibitors and the horticultural talents of the county were evident.